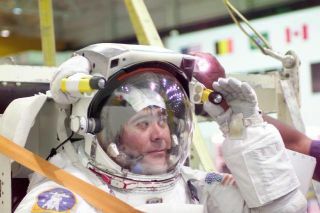 Cosmonaut Salizhan S. Sharipov, Expedition 10 flight engineer representing Russia’s Federal Space Agency, makes final adjustments on a training version of the Extravehicular Mobility Unit (EMU) spacesuit prior to being submerged in the waters of the Neutral Buoyancy Laboratory (NBL) at the Johnson Space Center (JSC). The two astronauts living aboard the International Space Station (ISS) are preparing for the first spacewalk of their mission with a combination of experience and enthusiasm, NASA flight controllers said today. ISS Expedition 10 commander Leroy Chiao, a spacewalking veteran, and flight engineer Salizhan Sharipov plan to exit the orbiting facility on Jan. 26 for a 5.5-hour job of installing new hardware on the station's exterior. "The Expedition 10 crew is in great shape and doing extremely well," said Derek Hassman, Expedition 10's extravehicular activity (EVA) flight director, during a press briefing at NASA's Johnson Space Center today. "The crew is extremely focused and we're very excited about going out the door next week." That focus will come in handy for Chiao and Sharipov, who will have to pull themselves equipment across 100 feet (30 meters) of space station exterior - starting from the Russian Pirs docking compartment - to reach their first EVA worksite outside the Zvezda service module. The Expedition 10 crew will have to make to make the trek hand-over-hand, toting themselves and their equipment without the aid of an extendable 50-foot (15 meter) boom - called Strela - that has served as a shortcut for past ISS spacewalks. "The Strela EVA crane is unable to reach this worksite," said Scott Bleisatch, Expedition 190's lead EVA officer, during the briefing. Chiao and Sharipov will don Russian-built Orlan spacesuits during the spacewalk. During their spacewalk, Chiao and Sharipov are expected to attach two commercial payloads, including the German-built Rockviss robotic experiment, life science study hardware and other scientific equipment, to the space station's exterior. The Expedition 10 crew will also inspect three exhaust vents to determine if any of them have become clogged. One of those vents is used by the space station's Elektron oxygen generator to expel excess hydrogen, while another is used by a Russian-built system to scrub carbon dioxide from the cabin air, Hassman said. The third vent is used to screen the atmosphere for trace contaminants, he added. Since both Expedition 10 crewmembers will be working outside the ISS during the EVA, flight controllers will monitor the empty space station interior from the ground. ISS crew complements have been limited to two members - as opposed to the typical three person details - since the grounding of NASA's space shuttle fleet following the loss of Columbia and its seven-astronaut crew. "One of the challenges has been that we don't have the third crewmember inside to respond to unexpected circumstances," Hassman said, adding that Chiao and Sharipov will close a number of hatches to safeguard the ISS while flight controllers monitor station status from the ground. Flight controllers will also watch the performance of NASA-built ISS stabilizers called control moment gyroscopes in case the added strain from the spacewalk puts too great a load on them. If that occurs, the space station would rely on Russian thrusters for orientation, but would have to drift freely if Chiao and Sharipov are working near any of the thruster nozzles. NASA officials said the ISS could float in a free-drift mode for no more than 45 minutes before a correction would be required, but the only Expedition 10 work task that would conflict with the thruster system should only take about 30 minutes. Chiao is no stranger to working with only a spacesuit for protection from the harsh environment of space. He has made four EVAs during two past shuttle flights to help build the ISS. The Jan. 26 spacewalk will be his first EVA staged from the space station. It will also be the first spacewalk ever for Sharipov, who served as a mission specialist aboard the shuttle Endeavor during its 1998 flight to the Russian space station Mir before joining Expedition 10. "It's very interesting to me to be able to make such an experience in space," he said to a reporter this week during an interview broadcast on NASA TV. NASA officials said that, under direction from Russian flight controllers, Chiao and Sharipov will both wear Orlan spacesuits marked by a red stripe during the spacewalk, departing a bit from the typical red stripe-blue stripe spacesuits to delineate who's who out in space. Chiao's spacesuit will bear the U.S. flag in order to tell the two men apart, they added. The Jan. 26 EVA is set to be the 57th spacewalk in support of ISS maintenance and the 42nd staged from the space station itself as opposed to the space shuttle. It is expected to be the 14th spacewalk for work on the Zvezda module.